Schizophrenia is a multifaceted syndrome characterized by distinctive behavioral symptoms, cognitive deficits, and a complex etiopathogenesis, which seems to involve neurodevelopmental anomalies and a combination of genetic and environmental factors (1, 2). Among the environmental factors, Toxoplasma gondii (T. gondii) is gaining increasing attention, and a causal association between the protozoan infection and schizophrenia has been repeatedly suggested (3–9). Over the last decades, studies on T. gondii antibodies (Abs) in patients with schizophrenia revealed higher levels of anti-T. gondii Abs in the affected persons when compared to controls (8, 10–12). Interestingly, higher anti-T. gondii Ab levels were also found in mothers of offspring who later developed schizophrenia (13) and in newborns who later were diagnosed with the disease, as compared to controls (6, 14). This suggests that toxoplasmosis in early life might affect neurodevelopment and contribute to later onset of schizophrenia. However, the molecular determinants and mechanisms by which T. gondii infection might contribute to the pathophysiology of the disease remain unclear. One major pathophysiological mechanism underlying development of schizophrenia seems to be N-methyl-d-aspartate glutamate receptor (NMDAR) dysfunction (15–17). The NMDA model of schizophrenia originated from the observation that NMDA antagonists, like ketamine or phencyclidine (PCP), transiently induce symptoms that mimic psychotic episodes (18–21). Following these initial observations, a large body of genetic and molecular evidence has accumulated in the last three decades indicating NMDA dysfunction as a convergence point in the development of schizophrenia (22–27). NMDA dysfunction not only can provide a satisfactory explanation of behavioral and cognitive symptoms of schizophrenia but is also consistent with the neurodevelopmental aspect of the disease, given that early NMDA aberrations/damage can translate into clinical onset later in life (22, 28, 29). In summary, the NMDA model of schizophrenia seems then to be the common pathway of different etiological factors and is characterized by an early-damage late-onset temporal pattern, which is consistent with findings on increased risk of schizophrenia after early-life T. gondii infection. It is therefore reasonable to hypothesize that T. gondii can affect NMDAR function and glutamatergic neuronal circuits. On this basis, the present work examines the hypothesis that immune responses to T. gondii may relate to NMDAR dysfunction by way of cross-reactive mechanisms and anti-NMDAR Abs. The rationale is that when a pathogen has sequence/structure similarity with human proteins, then anti-pathogen immune responses may cross-react with human proteins that share sequences/structures with the pathogen, thus triggering autoimmunity (30, 31). Such a hypothesis originates form the observations that (1) anti-T. gondii Ab levels are, as discussed above, higher in schizophrenic patients (8, 10–12), thus suggesting that immune responses following T. gondii active infection might play a role in the association of the parasite with the disease and (2) NMDAR blocking Abs are present in subjects with schizophrenia, schizoaffective, bipolar, and major depressive disorders (32–37), thus suggesting a role of anti-NMDAR immunoreactivity in the genesis of NMDA dysfunction in schizophrenia and other neuropsychiatric disorders. Moreover, a direct effect of early toxoplasmosis on behavioral anomalies and elevation of anti-NMDAR autoantibodies was found in a recent study on mice (38). In light of this immunologic context, T. gondii proteome and the seven NMDAR subunit proteins (NMDA 1, 2A, 2B, 2C, 2D, 3A, and 3B) were searched for common peptides that might underlie immune cross-reactions between the protozoan and the human host. Data are reported showing that the T. gondii proteome and NMDAR subunits share a vast epitopic peptide platform that is centered on the 2D subunit and appears to be potentially significant to schizophrenia pathogenesis. The seven human NMDAR subunit aminoacidic sequence analyzed in this study were retrieved from the UniProt database1 (39), and are listed with their alternative names in parentheses, followed by amino acids (aa) length: NMDA 1 (GluN1, NMDZ1), 938; NMDA 2A (GluN2A, NMDE1), 1,464; NMDA 2B (GluN2B, NMDE2), 1,484; NMDA 2C (GluN2C, NMDE3), 1,233; NMDA 2D (GluN2D, NMDE4), 1,336; NMDA 3A (GluN3A, NMD3A), 1,115; and NMDA 3B (GluN3B, NMD3B), 1,043. The protein sequence of each NMDA subunit was dissected into sequential hexapeptides that overlapped each other by five aa (for example, MSTMRL, STMRLL, TMRLLT, MRLLTL, and so forth). This procedure produced a library consisting of 8,578 NMDAR subunit hexapeptides. Each NMDAR hexapeptide was used as a probe to search the entire T. gondii proteome for occurrences of the same hexapeptide using the Pir Peptide Match program2 (40). Toxoplasma gondii (strain VEG, NCBI Tax ID: 432359) was investigated. The T. gondii proteome consists of 8,404 proteins (Uniprot proteome: UP000002226). The protozoan Entamoeba histolytica (NCBI Tax ID: 5759; 7,959 proteins; Uniprot proteome: UP000001926) was used as a control. The Immune Epitope DataBase3 (IEDB) (41) was searched for epitopes containing (or corresponding to) NMDAR hexapeptide(s) shared with T. gondii and experimentally validated as immunopositive in humans. Details, references, and immunoassay type for each epitope reported in the present study are available at http://www.iedb.org/advancedQueryEpitope.php. Sequence-matching analyses were carried out at the 6-mer level since a grouping of 5–6 aa represents the minimal immune unit able to induce specific Abs and to determine specific antigen–antibody recognition (42–44). The hexapeptide sharing between NMDAR subunits and T. gondii proteins and its immunological potential is quantified in Table 1 and detailed in Table S1 in the Supplementary Material. Table 1 shows that the seven NMDAR subunit proteins share a high number of hexapeptides with the protozoan proteome. On the whole, 2,215 out of the 8,578 hexapeptides composing the NMDAR library repeatedly occur in the protozoan proteome, for a total of 5,802 multiple occurrences. Theoretically, such an impressive level of peptide sharing equates to a vast source of potential cross-reactions in case of active toxoplasmosis and, indeed, NMDAR hexapeptides shared with the T. gondii proteome are also present in immunopositive epitopes (Table 1, last column). Table 1. N-methyl-d-aspartate receptor (NMDAR) hexapeptide sharing with Toxoplasma gondii proteome. In order to define the immunologic potential of the hexapeptide commonality between NMDARs and T. gondii, the shared 2,215 hexapeptides were analyzed using the IEDB, an immune epitope catalog resource, in search of epitopes experimentally validated as immunopositive in the human host, and containing (or corresponding to) hexapeptides shared between T. gondii and human NMDAR proteins. One hundred sixty out of the 2,215 hexapeptides shared between the 7 human NMDARs and T. gondii were found to be disseminated through hundreds of IEDB epitopes that have been validated as immunopositive in humans. 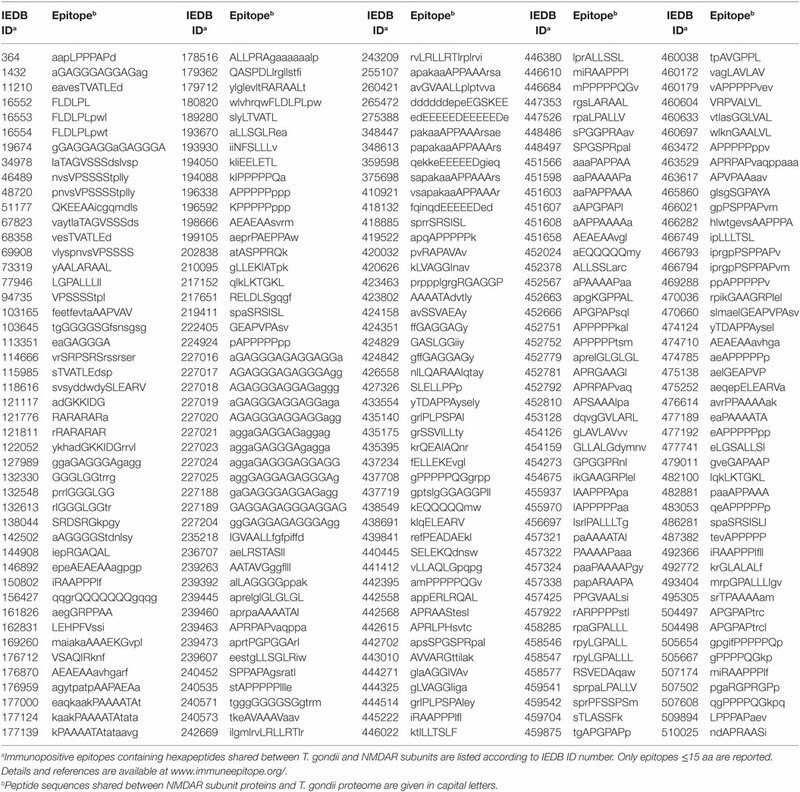 The 160 epitopic NMDAR hexapeptides and the IEDB epitopes are described in Tables 2 and 3, respectively. Table 3. Immunopositive epitopes containing hexapeptides shared between the seven human N-methyl-d-aspartate receptor (NMDAR) subunit proteins and T. gondii proteome. Control analyses using the protozoan E. histolytica, a human pathogen associated with intestinal and extraintestinal infections (45), highlight a lower extent of peptide sharing (Table 4), thus indicating that the intensity of the hexapeptide sharing between T. gondii and the NMDAR subunits—in particular, NMDA 2D and 3B—is specific (Tables 1 and 2). The detailed description of the peptide sharing between the NMDAR subunits and the protozoan E. histolytica is reported in Tables S2 and S3 in Supplementary Material. Table 4. N-methyl-d-aspartate receptor (NMDAR) hexapeptide sharing with Entamoeba histolytica proteome. Tables 2 and 3 indicate that T. gondii active infection might induce immune reactions able to cross-react to different extents with the seven NMDAR subunits. In particular, analysis of Table 2 shows that epitopic hexapeptides shared with T. gondii are mostly allocated in the NMDA 2D, 3B, and 2C subunits (58, 44, and 22 epitopic hexapeptides, respectively), whereas a relatively lower level of hexapeptide sharing characterizes NMDA 2A, 1, 3B, and 3A (16, 10, 8, and 7 epitopic hexapeptides, respectively). This appears to be relevant in light of the fact that NMDARs consist of four subunits, two of which invariably are NMDA 1 subunits that can associate with NMDA 2 subunits or a combination of NMDA 2 and NMDA 3 subunits. Such a variable composition results in a large number of NMDAR subtypes, which present different spatiotemporal patterns of expression during neurodevelopment and in the young/adult life (46). For instance, NMDA 2B and NMDA 2D are expressed during embryonic development, whereas NMDA 2A and NMDA 2C gene expression starts after birth; NMDA 2A and NMDA 2B are highly expressed in the cortex and hippocampus and NMDA 2C in the cerebellum of adult rodents (47–52). Likewise, NMDA 3A and NMDA 3B genes have specific developmental patterns of expression (53). Even the NMDA 1 subunit, which is a constitutive component of all NMDARs, presents a heterogenous distribution and a varying immunoreactivity potential when its seven isoforms are analyzed (54). For example, only immune cross-reactions against 6 out of the 10 epitopic hexapeptides present in all NMDA 1 isoforms (Table 2)—namely, AGGIVA, EEEEED, ELEARV, ELLEKE, SPGSPR, and SVARAA—should be able to produce a diffuse immunoreactivity in the brain. Hence, T. gondii-induced immune cross-reactions might have different outcomes depending on the targeted NMDAR subunit and might target different subunits depending on the timing of exposure to the protozoan. Indeed, the timing of exposure to T. gondii is a crucial factor in generating different specific anti-NMDAR Abs and, consequently, different associated neurobehavioral disorders (38). – subsequently declines and persists mainly in the hippocampal interneurons, most of which are somatostatin (SOM)- and parvalbumin (PV)-positive cells. Translating data from animal models to the human brain, it is logical to presume that immune cross-reactions involving NMDA 2D in the fetus and the newborn can extensively occur throughout the brain, whereas secondary immune responses after early sensitivization might target hippocampal PV- and SOM-positive interneurons in the young/adult. Indeed, alterations in the hippocampal PV- and SOM-positive interneurons have been repeatedly related to the hippocampal hyperactivity that characterizes schizophrenia (55–57). The vast epitopic peptide sharing between T. gondii and the seven NMDAR subunits (see Tables 2 and 3) suggests that anti-T. gondii immune responses cross-reacting with NMDARs might lead to NMDAR damage and dysfunction, targeting in particular interneurons expressing NMDA 2D. Crucially, this hypothesis, which links mechanistically toxoplasmosis and schizophrenia by way of peptide sharing with NMDARs, is consistent with the well-established NMDA dys/hypofunction model of schizophrenia (15–17). As mentioned in the Introduction, the NMDA model is based on the observation that NMDA antagonists, like PCP, Ketamine, and MK801, induce symptoms that resemble schizophrenia (2, 17), and it seems to be able to provide a good account of some aspects of the complex symptomatology of the disease, including cognitive symptoms (17). Remarkably, both of these two fundamental aspects of the NMDA model are related to the NMDA 2D subunit type. First, targeting NMDA 2D appears to be a major mechanism in the pharmacodynamics of MK801 (58), ketamine (59, 60), and PCP (61, 62). Second, 2D-containing NMDARs are typically expressed in GABAergic interneurons, where they largely contribute to excitatory post-synaptic potentials (49, 51, 63). Consequently, NMDAR dysfunction in these cells would translate into reduced GABAergic activity and consequent reduced inhibitory control of pyramidal cell activity (2, 64). The excitatory–inhibitory balance in cortical networks is crucial for generating high-frequency (gamma) oscillatory activity (65, 66), and it appears that the disruption of gamma-band oscillations (GBOs) might indeed underlie cognitive deficits in schizophrenia (67–70). On the one hand, GBOs are well known to be physiologically related to higher cognitive functions (71–74), on the other hand, they are typically altered in schizophrenic patients (75–77). Moreover, ketamine alters gamma oscillatory activity by targeting NMDA 2D (59). It appears then that NMDA 2D damage can be directly related to cognitive deficits in schizophrenia. In summary, in the complex and articulated picture that connects PV interneurons, brain oscillation, and cognition [Ref. (78, 79) for review], a large body of evidence from pharmacological, genetic, electrophysiological, and clinical research converges on a critical role of NMDA 2D in cognition within the context of the NMDA model of schizophrenia. It is likely then that T. gondii-induced anti-NMDA 2D cross-reactivity might, among other different mechanisms triggered by both genetic and environmental factors, play a role in contributing to NMDA dysfunction and GABA hypofunction, thus resulting in cortical circuitry disequilibrium and, potentially, in disruption of brain oscillation and cognitive processes. This work presents and examines the hypothesis that the relationship between T. gondii and schizophrenia might be explained by way of shared peptides (as molecular determinants) and immune cross-reactivity (as biological mechanism) between T. gondii proteins and the NMDAR subunits. The high and specific peptide commonality with the NMDARs shown by T. gondii, as compared to the control, supports the possibility that the infection might induce anti-NMDAR immune responses in the human host through cross-reactivity (Table 1) and more so in light of the epitopic nature of many of the shared peptides (Tables 2 and 3). Such a hypothesis is consistent, on the one hand, with previous studies describing the potential neuropsychiatric relevance of the vast peptide commonality existing between infectious agents and the human host (80–82) and, on the other hand, with the well-established NMDA dysfunction model of schizophrenia. Hence, a possible scenario unfolds, where the differential spatiotemporal patterns of expression of the NMDAR subunits might generate the diversity of neuropathological outcomes. In this regard, immune attacks on NMDA 2D, a main potential target of T. gondii-induced cross-reactions, may represent a mechanistic link between T. gondii infection and NMDAR dysfunction in neuropsychiatric disorders. In summary, immune cross-reactions with NMDARs following T. gondii infection might be one of the factors contributing to the pathophysiology of schizophrenia and associated disorders, and NMDAR subunit composition could relate to the timing and the targets of the neuropathologic sequela of the exposure to T. gondii. The hypothesis presented here might help to address aspects of the complex and multifactorial etiopathogenesis of schizophrenia in future clinical and basic research. GL designed the study, performed the analyses, and wrote the manuscript. GL gratefully acknowledges support from the Deutscher Akademischer Austauschdienst (DAAD), the Deutsche Forschungsgemeinschaft (DFG), and the Freie Universität Berlin, Germany. The Supplementary Material for this article can be found online at https://www.frontiersin.org/article/10.3389/fpsyt.2017.00037/full#supplementary-material. 17. Javitt DC. Glutamatergic theories of schizophrenia. Isr J Psychiatry Relat Sci (2010) 47:4–16. 18. Javitt DC. Negative schizophrenic symptomatology and the PCP (phencyclidine) model of schizophrenia. Hillside J Clin Psychiatry (1987) 9:12–35. 30. Oldstone MB. Molecular mimicry and immune-mediated diseases. FASEB J (1998) 12:1255–65. 42. Frank A. Immunology and Evolution of Infectious Disease. Princeton, NJ: Princeton University Press (2002). 52. Ewald RC, Cline HT. NMDA receptors and brain development. In: Van Dongen AM, editor. Biology of the NMDA Receptor. Boca Raton, FL: CRC Press/Taylor & Francis (2009). p. 1–15. 54. Laurie DJ, Seeburg PH. Regional and developmental heterogeneity in splicing of the rat brain NMDAR1 mRNA. J Neurosci (1994) 14:3180–94. Copyright: © 2017 Lucchese. This is an open-access article distributed under the terms of the Creative Commons Attribution License (CC BY). The use, distribution or reproduction in other forums is permitted, provided the original author(s) or licensor are credited and that the original publication in this journal is cited, in accordance with accepted academic practice. No use, distribution or reproduction is permitted which does not comply with these terms.